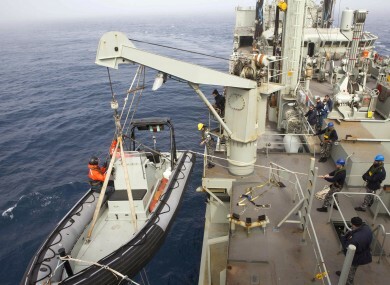 An inflatable boat is launched from HMAS Success. Defence Minister Hishammuddin Hussein said the objects were more than 2,500 km southwest of Australia, in the area where a desperate, multinational hunt has been going on since other satellites detected possible jet debris. The images were taken on Sunday and relayed by French-based Airbus Defence and Space, a division of Europe’s Airbus Group; its businesses include the operation of satellites and satellite communications. None of the objects were seen on a second pass, a frustration that has been repeated several times in the hunt for Malaysian Airlines Flight 370, missing since 8 March with 239 people aboard. It remains uncertain whether any of the objects came from the plane, they could have come from a cargo ship or something else. “If it is confirmed to be , at least we can then we can move on to the next phase of deep sea surveillance search,” Hishammuddin said. A total of 12 planes and five ships from the United States, China, Japan, South Korea, Australia and New Zealand were participating in the search, hoping to find even a single piece of the jet that could offer tangible evidence of a crash and provide clues to find the rest of the wreckage. Malaysia announced on Monday that a mathematical analysis of the final known satellite signals from the plane showed that it had crashed in the sea, killing everyone on board. The new data greatly reduced the search zone, but it remains huge, an area estimated at 1.6 million sq-km, about the size of Alaska. “We’re throwing everything we have at this search,” Australian Prime Minister Tony Abbott told Nine Network television. In Beijing, some families held out a glimmer of hope their loved ones might somehow have survived. About two-thirds of the missing were Chinese, and their relatives have lashed out at Malaysia for essentially declaring their family members dead without any physical evidence of the plane’s remains. Many also believe Malaysia has not been transparent or swift in communicating information with them about the status of the search. That also is the likely reason why Chinese authorities, normally extremely wary of any spontaneous demonstrations that could undermine social stability, permitted a rare protest on Tuesday outside the Malaysian embassy in Beijing, during which relatives chanted slogans, threw water bottles and briefly tussled with police who kept them separated from a swarm of journalists. Email “122 new objects spotted in the Indian Ocean, but nobody's sure they're MH370 ”. Feedback on “122 new objects spotted in the Indian Ocean, but nobody's sure they're MH370 ”.